On Monday, November 17th, four more of the greatest players to ever lace up skates in the National Hockey League will be inducted into the Hockey Hall Of Fame at the 2014 induction ceremony at the venerable Hall of Fame building in downtown Toronto, Ontario. This year’s inductees include NHL icons Rob Blake, Peter Forsberg, Dominik Hasek, Mike Modano, along with the late Pat Burns, famous for his 14-year NHL coaching career with a .537 winning percentage, and Bill McCreary, who officiated 1,700 regular season NHL games and 282 NHL playoff games before retiring in 2011. After his college hockey days at Bowling Green State University from 1987-1990, Canadian defenceman Rob Blake went on to play 20 NHL seasons with three NHL teams in his career. He also won a Stanley Cup as part of the Colorado Avalanche in 2001. Blake scored more than 40 points in 12 different seasons, and he is a member of the Triple Gold Club, having won a Stanley Cup, Olympic gold medal, and an IIHF World Championship. Sweden’s Peter Forsberg was drafted by the Philadelphia Flyers in the first round of the 1991 NHL Entry Draft. He was named the Rookie of the Year in 1995 and played 14 seasons in the NHL. Over the course of his career, Forsberg won two Stanley Cup championships (1996 and 2001) with the Colorado Avalanche, the Hart Trophy (2003) and IIHF World Championship gold medals (1992 and again in 1998). He also won Olympic Gold twice playing for Sweden (1994 and 2006). Czech goaltender Dominik Hasek won an impressive six Vezina trophies in his career. He also won the Hart Trophy twice (1997 and 1998), making him the only goalie to be named the league MVP since Jacques Plante in 1962. He has two Stanley Cup championships under his belt as well, winning with the Detroit Red Wings in 2002 and 2008, and he took home Olympic Gold in 1998. Michigan native Mike Modano began his 22-season NHL career after being drafted first overall in the 1998 NHL Entry Draft by the Minnesota North Stars, where he played 21 of those seasons. Modano continues to hold the record for the most goals (561) and points (1,374) by a U.S.-born player. He also helped lead the Dallas Stars to the Stanley Cup in 1999. 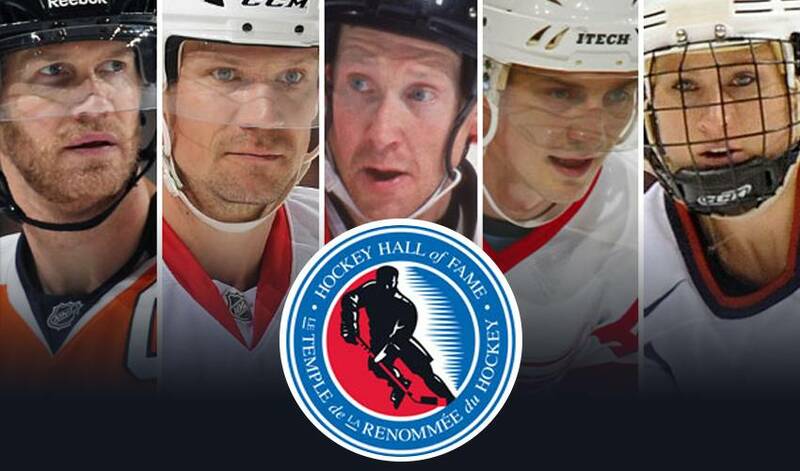 For more information on the 2014 Hockey Hall of Fame inductions, please visit http://www.hhof.com/. Modano retires from the game this week as one of the faces of the modern NHL game.